John Bedini built an earth light "the easy way"
An air battery from carbon and magnesium ribbon. such as graphite amoung other crystal forms having increased properties. The magnesium also under review as to the various grades and types ie form and function. The simple circuit in conjunction with C/Mg cell has some very interesting attributes. in a series of videos by John Bedini. John Bedini "Earth Light video"
Last edited by mikrovolt; 11-11-2011 at 12:51 AM. I am glad that you started a seperate thread for this. I partially replicated it today and it is very different. Well I almost got the whole thing done but my graphite & magnesium battery was a little too small to run it. It is an interesting circuit. Mine will run all the way down to .65 volts but the amp draw was pretty high. Some things for you to try. You could add a resistor in the base circuit if needed. My circuit is working on 5 to 6 Ma If you lower the inductance the base resistor will help. This is going to be critical so start in the base with 50 ohms and work your way up, since you have a breadboard you can plug them in and test, Transistors make a difference too. If you would stretch out two # 30 wires for 45 feet then wind on a piece of welding rod as small in space as you can get. Then make a monopole forced oscillator with a 1K base resistor it will work at 2.5 Khz at 6 Ma. It will run off your Lasersaber Battery. The trick, try it. take the Lasersaber battery, which is not a battery, I will explain later. Take the cell and squeeze it up and down for a few minutes it will come back to life and run that circuit. You will understand when you do that what is going on with it. Also use Felt in place of the cotton or paper towel. Last edited by chuck H; 02-07-2012 at 05:39 AM. This may explain what is going on in this cell, Lab test were done at my shop and we have the temperature differences and what they will run and for how long, If you try to look at this like a real battery it will fail as the magnesium will dissolve in a real battery Galvanic action.do not add salt or anything else. and warming the warm area even more. The next step would be, for this time of the year, to have some type of construction, of the cell, where the cool part was outside, and the warm part was inside. It could be built into a window somehow. Or is this speculation incorrect ? Quite interesting. I used a basic JT circuit on one of the small carbon/magnesium cells I made up some time ago. 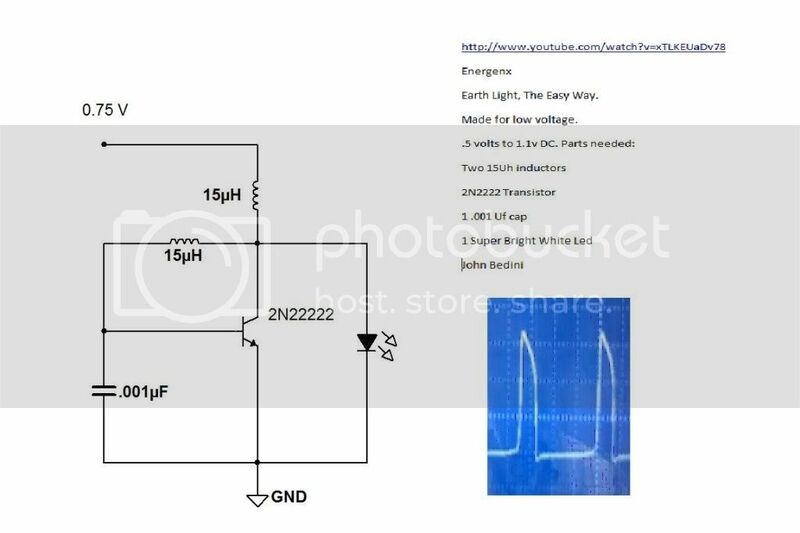 I found if you run the LED back to positive instead of going to ground the LED is brighter, it seems to increase the voltage through the cirucit. Partial recycling maybe? My cell is several months old and so far it hasn't shown any signs of decay on the magnesium. I've never thought of it as a thermocouple - kind of opens your eyes to the possibilities.... Thanks for sharing John !!! This is what our research has been pointing to – the erosion part not the differential. Like many of these devices, we have to think outside the box in order to “get it” most times, well ok, all times – we need a good shove in the right direction. Thank you for sharing that detailed explanation. In any of your experiments, did you try using a magnesium aluminum anode rod? We picked some up to wrap a copper coil around; it puts out some nice power when moist. We have also wrapped magnesium ribbon around copper pipes which seems to put out good amperage when moist. Thanks for the tips on how to proceed and the video expaining what is happening in the carbon / magnesium cell. When I made the iron pyrite rock battery I noticed that the rock was noticably cold. I was going to post that finding but I thought that people might think that I was nuts. I don't have a good temp measuring tool so I tried to use a plain old meat thermometer. The temperature differential between ambient air and the rock didn't show up very well so I just attributed the effect to evaporative cooling as the water went away. What I couldn't understand was why the rock felt colder than the magnesium or zinc. I guess that this might be the same effect as what is happening in the carbon / magnesium battery----or maybe it was just evaporative cooling. Last edited by Lidmotor; 02-03-2011 at 07:09 PM. Here I show the Earth Light and the way the cell works along with the forced oscillator. I'm hoping you can understand what is going on. Negative resistor effect in the graphite. The difference between hot and cold outside is fog then the temperature must be just right. this can produce an electrical effect know as current. These videos and postings are really helping. Thanks. Here I show the Earth Light 4 and the way the iron cell works along with the forced oscillator and the new wave shape. Negative resistor effect in the graphite by 2 degrees. This circuit is far more efficient then the Joule Thief as the circuits have no closed gap magnetically. I did say each battery had a different wave shape when producing current. This wave shape is more like the Monopole Motor running. I'm testing for the best material for thermal effect.The most important thing is to build devices that work in small Earth currents, 10 Ma is not allot of power for these devices as the cell can produce far more. Each one of the cells must work into a much different impedance, Earth cells will require a different coil impedance to work properly when oscillating voltage. The earth requires a very high impedance, then the energy flows. But I want to document this work on this group. Last edited by John_Bedini; 02-04-2011 at 12:38 AM. I “dissected” one of our 8-month-old carbon rods, posted a vid just in case any one is interested in seeing what the ribbon looks like when it’s all "dried up". Opened the loop and are now charging a super cap w/ our WM rotor - still rectifying our second winding off the bi-filer to harvest spikey. Pretty slick ! I'm getting the exact same wave from mine. These things work great. I made one of those large batteries today using a carbon water filter element and it worked extremely well. It put out 1.75 volts and drove a load at 21mA. I have it hooked up to the original Earth Light circuit that I built yesterday. Felt was used as the insulator and only distilled water was applied. I will put it in a shallow dish with distilled water and see just how long it will run. I will also take temperature readings ( I got a small infrared temp meter at Radio Shack today) to see what happen there. Using a rod inside will probably not work as well. The current is a function of the contact area between the battery plates. I think a rod inside would produce a smaller area than the ribbon on the outside. However, the rod should last longer than the ribbon. Last edited by xee2; 02-04-2011 at 05:41 AM. I will show that experiment soon as to how much you get out. Trying to make a cheap functional carbon/Magnesium battery, I used a 1 inch diameter acrylic tube, 14" long and wrapped it with carbon fiber tow so it was completely covered and then wrapped it with paper towel and magnesium ribbon. I'm getting 8 mA at .7 volts when at full load which is running a simple joule thief and lighting a red LED. I was disappointed at the cost of larger graphite and carbon cylinders, and since I had some carbon fibers around as "tow" it made sense to try them. Although the battery lidmotor posted from the carbon filter is cheap as well! Here is what I notices about the magnesium ribbon. Most of it is a low grade and is very pitted when you take it out of the package, yes it burns and that is what they sell it for. I have ordered 1 inch sticks 99.9 grade. The carbon graphite rods 3 inches in diameter are about 27 dollars each + the shipping. Normally a batteries uses dilute acid of some kind, this will destroy the magnesium or anything else you put on it. I'm not going to call these batteries unless you use some form of acid or salts to form the galvanic action. One of my lights and motors have been running for two weeks straight no distilled water added just vapor inside the tube, my real batteries do not do that, and I know batteries. This is a much different beast. The air is doing more damage then the distilled water. Magnesium is a very different metal so is carbon graphite. With Carbon Graphite you can make a negative resistor with the correct currents Chung has proved that. I have one running at 32 degrees and some times the temperature has been 5 degrees, no flicker in the power it is putting out on the meters. My opinion. Here they are, Iron wire zinc coated, under close examination (Microscope) you can see that little holes that let in water so galvanic action starts from inside the wire as a direct shorted battery of it's own, it only takes one day to start. Adding salt is the worst condition, so that is why the fences start out shiny and slowly turn black and rust away, they make little batteries on the inside and eat the zinc away. So iron wire is out of the question for the cells, more later. I will post a video of that along with the waveform as the oscillator shows what type of cell your dealing with, Physics is Physics and you can't change it. But instead of talking about it do the experiments you will find out what is going on. "Thanks Mikrovolt that is correct about the materials". After reading a lot of Bearden's work, and after building one of these carbon/Mg devices, I have to ask. In your opinion, do these carbon/Mg cells put off "normal" electricity, "cold" electricity or something else altogether? Any thoughts or insights from your experience would be greatly appreciated! I can only give my opinion here as to what my findings are so far. Carbon Graphite is a very different material an has been used by many people as negative resistors but they do put out normal power after excited. One indication of that is extreme cold operation. Magnesium is a magic metal with most things The two together allow this process and effect to show up. The more current that the system requires the colder the Graphite will be, as things cool off you will get more power transfer to the load, yes in a way it is cold electricity. The next thing is to build "Negistor" circuits with the lighting, one could use a "Tunnel Diode" and run the circuits negative. With this type of cell you have allot of unknowns which I hope we can discover as to the workings of this device. If you look at the Stubblefield coil Lasersaber made he had two batteries working to destroy the cell, salt water and zinc iron wire so where the wire broke the wire was already pitted and it formed a battery of it's own. The stubblefild cell was different because it used cotton covered iron wire, no zinc to cause that action. So Lasersaber built a copper iron zinc galvanic battery to be doomed in the end because of the zinc over the iron. Hope this helps you in your understanding of this effect. Last edited by John_Bedini; 02-05-2011 at 12:12 AM. you can tell what type cell is running. The cells must use high impedance devices as loads. The best working devices would be miniature oscillators and non magnetic motors at this point. I was wondering can you post your monopole circuit you are using in #5? I tried to do something the like the monopole with a mpsa06. Very interested in seeing your "negistor" circuit. My first carbon/Mg cell is sealed in a plastic tube with distilled water running a joule thief continuously. I'm curious to see how long it lasts! I think we could make a much more powerful cell by layering. I originally used 25k carbon fibers wound around an acrylic tube for the first layer and then added the magnesium ribbon on top. Carbon fibers are sold as "tow" or ribbon and 25k is the number of strands. The carbon fiber strip is about 1/3" wide with 25k. There's absolutely no reason why you couldn't keep layering carbon fibers and magnesium over and over again, wiring in series or in parallel the layers until you get the desired current or voltage! Here is a video showing the wave form on my setup. I reworked the circuit and put the large "cell" in a clear plastic bottle that has the top cut off. I put about 1" of distilled water in the bottle. I ran several things with this today and some things worked better than others. PS----Here is the "Big Cell" powering an electronically fired pulse motor. Last edited by Lidmotor; 02-05-2011 at 05:47 AM. be a suitable way to go for this circuit since it goes negative? Such as this kind of circuit - a negative oscillator or negistor oscillator? Yes they can be in series. Did that at work today. Have not done any testing other then that at this point. I will post some results. When it happens. Has anyone else done this yet?